Menstrual Migraine - What is that? I admit I do suffer from a few unpleasant symptoms during PMS, but it's nothing severe that can disrupt my routine. Sometime back, I'd heard one of my friends saying that she usually has headaches / migraines around the time of her period. At that point of time, I didn't think much of it. And though I didn't voice my thoughts to her, I believed that it was just a coincidence and that she was mistakenly linking her headaches with her menstrual cycle. But apparently I was wrong. 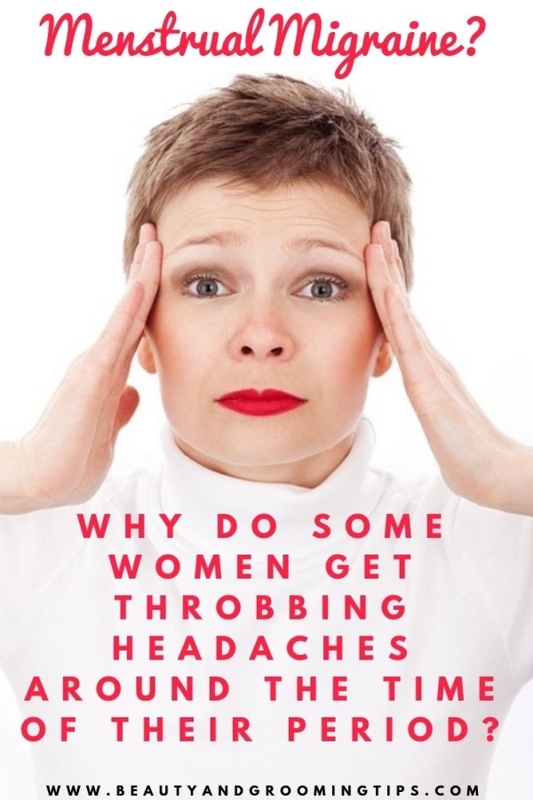 Some women do get a type of headache called menstrual migraine. It's a specific condition where the timing of attacks is linked to the menstrual cycle. Just 1-2 days before the period commences, there is a sudden fall in the amount of the hormone estrogen. This drastic drop in estrogen can allegedly trigger throbbing headaches. Studies show that migraine is most likely to occur in the two days leading up to a period and the first three days of a period. There is no aura with this type of migraine and it can often last longer than other types. This type of migraine is thought to affect fewer than 10% of women. The two most accepted theories on the cause for menstrual migraine are: (1) the withdrawal of oestrogen as part of the normal menstrual cycle and (2) the normal release of prostaglandin during the first 48 hours of menstruation. However, menstrual migraines that occur in the days following menstrual bleeding may be related to low ferritin (iron) caused by blood loss rather than to estrogen fluctuations, according a recent study. Researchers found that these migraines occur many days after the estrogen withdrawal. So they came to the conclusion that migraines that occur at the end of menstruation or end menstrual migraine (EMM) as it is called, is not the effect of hormones but mostly due to menstrual blood loss, resulting in a brief relative anemia with consequent migraine. They recommend the following diagnostic criteria for EMM: (1) predictable migraine headache (with or without aura) that (2) occurs immediately after or toward the end of menstrual bleeding. One of the researchers, Dr Calhoun said that patients showing such symptoms are usually treated with iron therapy, either as oral pills or intravenous iron infusions if the iron levels are too low. Remember that there are no tests to confirm the diagnosis of menstrual migraine. The only way to find out if you have it is to keep a diary for at least 3 months recording your headache/ migraine attacks and the days you menstruate. A nonsteroidal anti-inflammatory drug (NSAID) like ibuprofen or naproxen is usually prescribed to treat a menstrual migraine. Along with your migraine symptoms, these drugs can also relieve period cramps.The doctor may suggest that you take both an NSAID and a triptan to get relief. If your periods are regular and come every month like clockwork, the doctor may recommend these drugs a few days before your bleeding starts and to be continued for 2 weeks. To conclude, if you do suffer from headaches / migraine during menses, rather than self-medication, it's wise to consult your gynaecologist who will prescribe the right treatment for you. However, some find relief through alternative therapies like acupuncture, acupressure / reflexology, biofeedback etc; so no harm in trying that also! And if you have heavy bleeding, it's better to up your intake of iron-rich foods. Also read: Headaches during pregnancy can be dangerous. and avoid of well known migraine trigger foods.